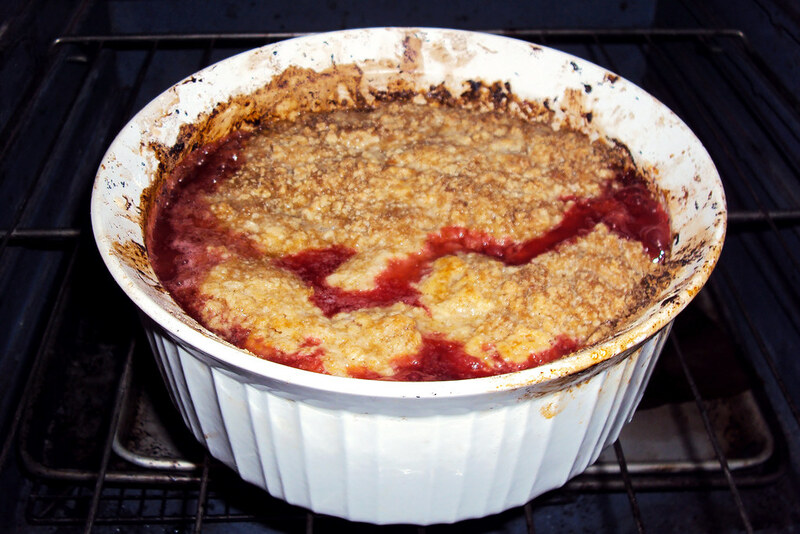 In this solo cooking adventure, Kate makes a seasonal dessert with strawberries and rhubarb. I wanted to make a pie. BF and I were having friends over for dinner and I promised a springtime menu. When I emailed my friends and tried to entice the Manhattanites to make the trek to my small Brooklyn apartment on a hot night I said: “I feel like cooking. Think Springtime. Think cold beer. Think Rhubarb.” Notice I didn’t say “Think Rhubarb Pie.” Oh no. Although it was my original intention, I subconsciously and conveniently gave myself a little out, just in case. Rhubarb Pie had been on my to do list ever since coming home from my trip to the Midwest, in which BF’s mom had on a whim (on a freakin’ whim, my friends!) whipped up a little pie with rhubarb from her garden. As soon as I had a bite of it, I knew I wanted to make it. I also knew it would not be on a mere whim. I would need to invite people over for motivation and an audience. I would need to buy a pie plate. I would need detailed instructions and utter silence in my apartment as I concentrated on the crust. But then there was slight confusion over if the friends would be coming over or not (okay, they’re not coming, I’ll make the pie next weekend), there was an extra shift I picked up (no time to buy a pie plate, even if I wanted to), there went the grand plans. But then the friends were coming over (yay! oh wait . . . . they were promised Spring), the rhubarb had been purchased even the pie plate had not, and I needed a dessert recipe that I could throw together. One that would require minimal technique and maximum deliciousness. A recipe that everyone (including myself) would love. I ambled back over in to familiar and dependable territory: the crumble. Although I have sworn I’m not a fruit dessert person, mix some fresh fruit with a little sugar, bake it under a thick buttery topping, and serve it warm with the best quality vanilla ice cream you can find, and I am going back for seconds, and then having it for breakfast the next day. I love crumbles, crisps, cobblers, whatever you want to call them. And since I had never cooked with rhubarb, I would still be in exciting territory. As usual, I went over to smittenkitchen.com for a little crumble help. 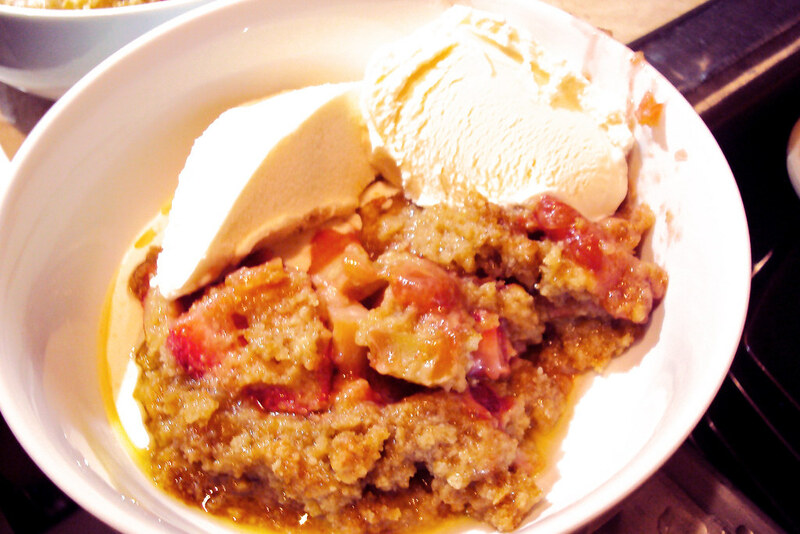 Deb (my idol, or someone I just know I could be friends with), had lovely pictures of a strawberry rhubarb crumble. I was sold. I took part of Deb’s recipe, part of my mom’s crumble recipe, and made up my own. I crossed my fingers, rather smugly. I was right. After a sort of springtime meal (if watermelon margaritas and black bean and goat cheese quesadillas with guacamole and mango salsa count as springy), and a respectable lull to look at vacation photos and crack open and sample some craft ale, the crumble was served. “Um, I just got a chubby,” my friend J announced after his first bite, eliciting laughs all around and the understandable rolling of eyes from his GF. Hearing that from J and C, and seeing the empty bowls were enough evidence that I had done good. But just to be certain, I polished off the rest of the crumble after everyone left. Combine filling ingredients in a baking dish (I used a deep round one, you can use a longer more shallow one if you prefer), and stir. If making ahead, cover and refrigerate. For the topping, combine dry ingredients, then add the butter. Worth through with your fingers (or two forks) until the butter is in small, pea-like crumbles. Spread over the filling and bake for 45 minutes, or until the top is browned and there’s a thick juice around the edges. Remove from oven and let it rest for 10-15 minutes. Serve warm with plenty of vanilla ice cream. 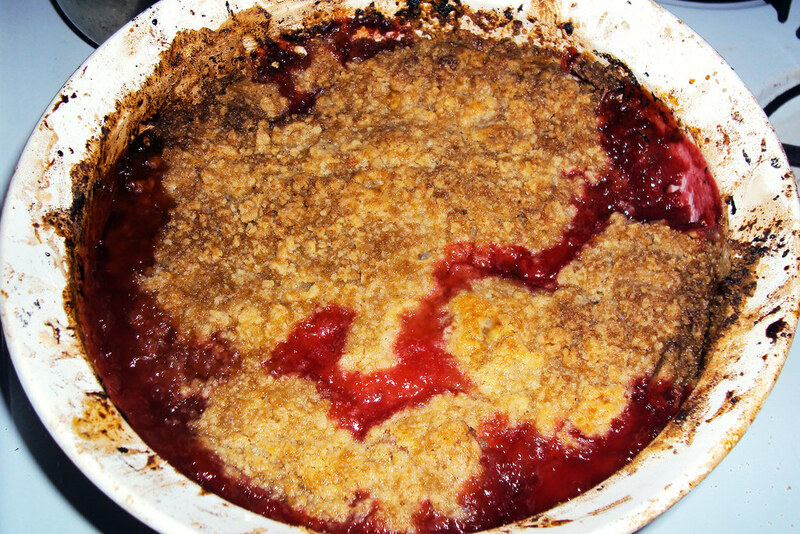 Oh and just to clarify…your Rhubarb Crumble was the highlight of my YEAR! I still dream about it. 🙂 Truly a fantastic dinner party Kate -every dish was magnifico, watermelon margaritas sublime and the crumble was out of this world amazing! Thanks again! C.